With the increase of deadly droughts and wildfires, climate change is quickly becoming a catastrophe that politicians, nor citizens can no longer ignore. Global warming not only continues to exacerbate poverty around the world, but it also risks the livelihood of future generations. However, the report from Intergovernmental Panel on Climate Change is of hope rather than fear mongering. In addition to recognizing the irreversible damage it has already caused to many homes and lives, the IPCC reported that we can reduce, and even avoid, the effects of climate change. As noted by The New York Times, this will require our political leaders to stop dragging their feet, and make use of newfound technologies that can bring emissions under control. Now that renewable energy prices like wind and solar power are dropping, this is becoming a more affordable option around the planet. Global climate change is a collective responsibility—it’s not able blaming politicians or other countries. Learn how to help and do your part: Enter for a chance to win a copy of bestseller The Sixth Extinction. 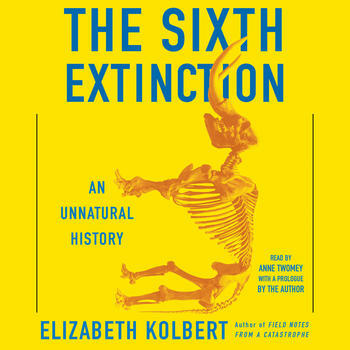 Written by two-time National Magazine Award winner and New Yorker writer Elizabeth Kolbert, this audiobook traces the evolution of extinction, compelling us to rethink our own humanity. From the author of Field Notes from a Catastrophe, a powerful and important work about the future of the world, blending intellectual and natural history and field reporting into a compelling account of the mass extinction unfolding before our eyes.